Tiger in Kanha National Park. Photo Courtesy Singinawa Jungle Lodge. MANY PEOPLE ASK ME what my favourite place in India is. 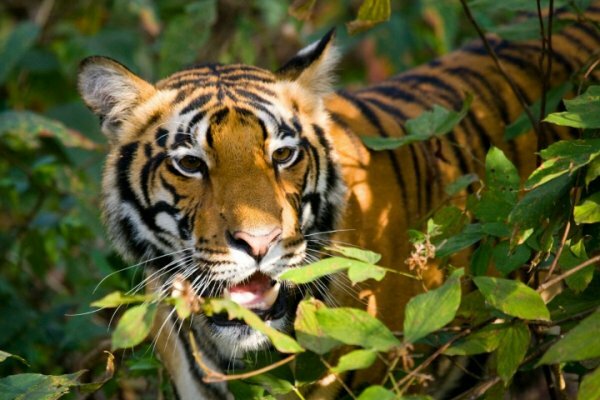 Kanha National Park and Tiger Reserve in Madhya Pradesh is at the top of the list. Madhya Pradesh Tourism’s website summarizes it quite succinctly: The largest park with the biggest cats. The only problem with this description is that it leaves out the magic. 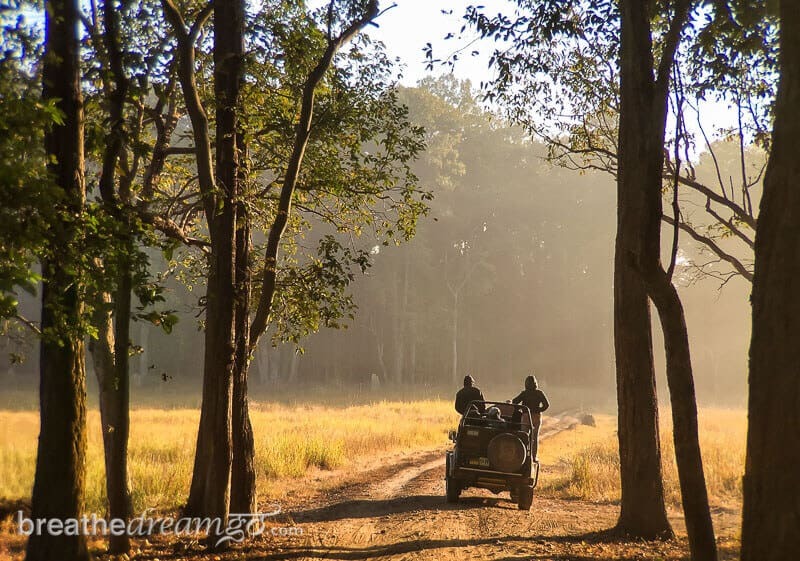 To me, there is almost no greater adventure than waiting in an open jeep, in the pre-dawn gloom, for the Kanha National Park gates to open, and then driving into the sal forest as the golden light of dawn illuminates the primeval scene. 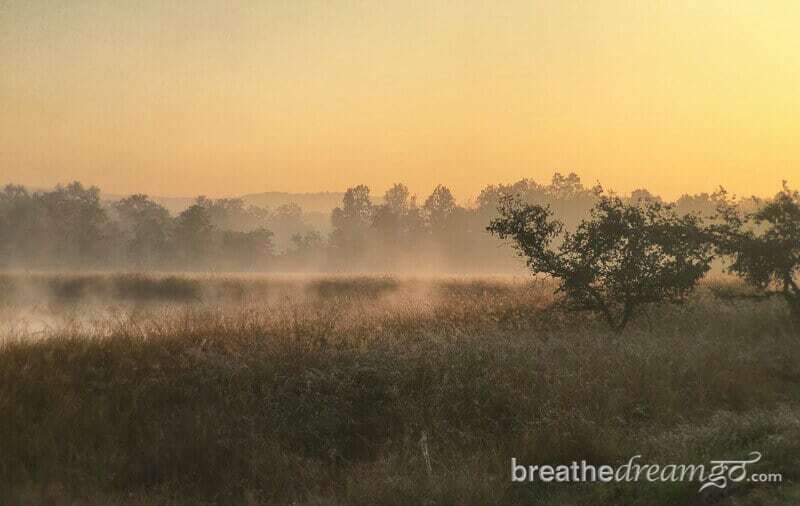 The air is filled with the songs of a myriad brilliant birds as herds of graceful spotted deer and regal Barasingha graze in the rolling meadows. Meanwhile, lurking silently in the shadows …a flash of stripes, a roar, power and poetry in feline form … the magnificent Royal Bengal Tiger. There is much, much more to see, do, enjoy, and explore in Kanha National Park (or any national park in Madhya Pradesh) than hunt for tigers. But the moment the guide or naturalist picks up the scent — a pugmark on the road or an animal’s alarm call — the chase is on. And it’s incredibly exciting. The jeep driver makes an educated guess as to where the tiger will appear and heads in that direction. You never know what will happen, and many times the tiger does not appear. And it doesn’t matter. It’s still amazing to be in such a beautiful place, a pristine environment for animals and wildlife, where they run free in a protected environment. But when a tiger does appear, you will feel a sense of euphoria that is unexplainable and unmistakable. Even the guides and naturalists, who see tigers every week, feel it. The tiger simply electrifies the forest. When a tiger appears, every animal becomes alert. Deer, jackals, monkeys, and other animals track the tiger’s movements and sound alarms, not only for their own kind, but for all. No matter how much stealth she uses, the tiger is never out of view, never unseen. She is always watched by the eyes of the forest. Also, tigers are territorial and hunt and move about in a predictable range. The well-trained guides and naturalists know the tigers in Kanha National Park, and know their movements and whereabouts. 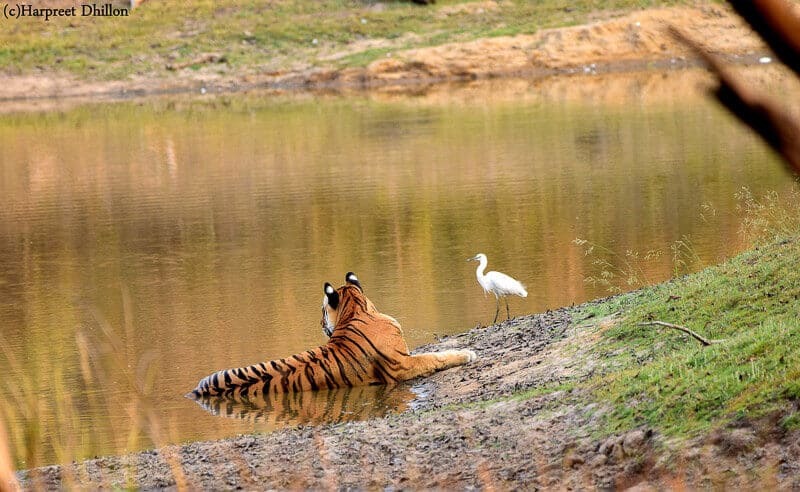 And this is the reason that tiger safaris in India are so exciting, and so often result in success. Within a protected area, criss-crossed with roads, they roam free. 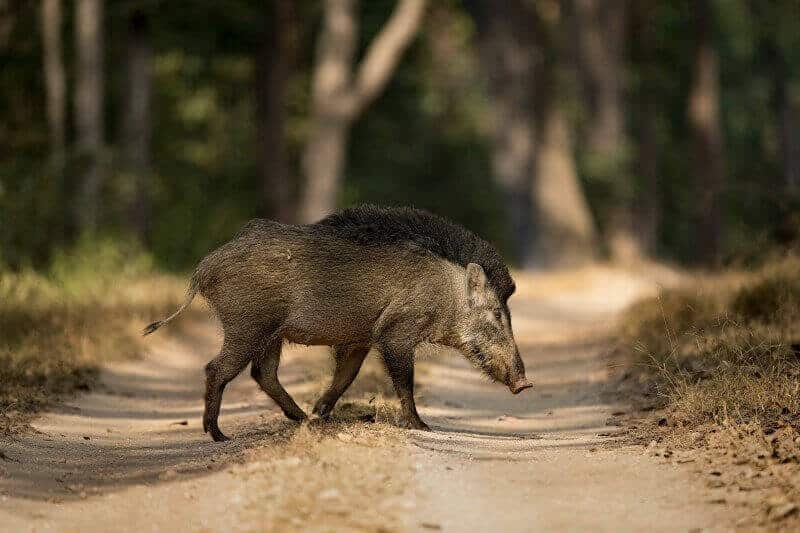 In a place like Kanha National Park, that is extremely well managed, the tiger, as the apex predator, has an abundance of food – primarily deer and wild pigs. 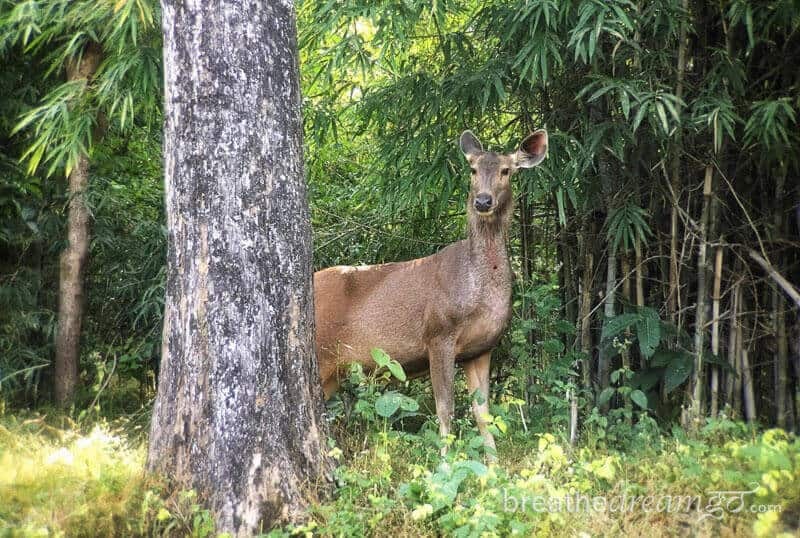 Barasingha deer in Kanha National Park. Photo Courtesy Harpreet Dhillon. 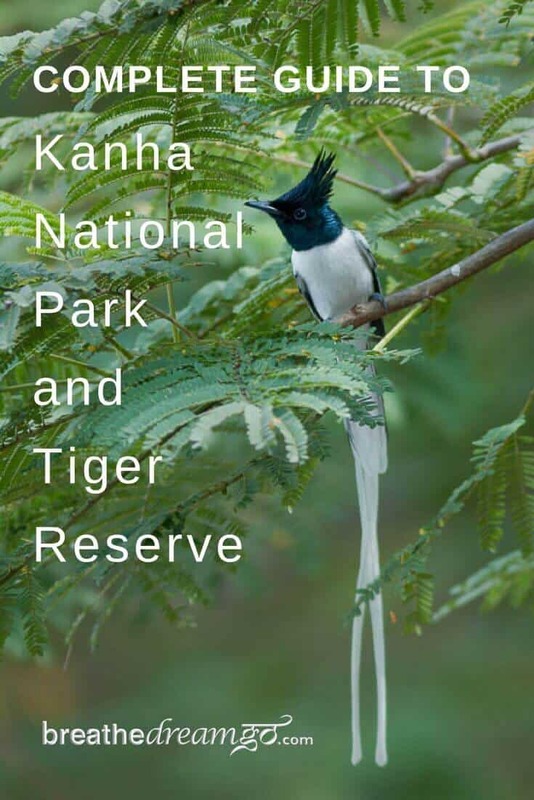 Kanha National Park is open from October 16 to the end of June. It closes for the summer / monsoon season. You always stand a decent chance to see tigers in Kanha, but the best time is March to June, when it gets hot and the tigers (and other animals) are forced to the waterholes. 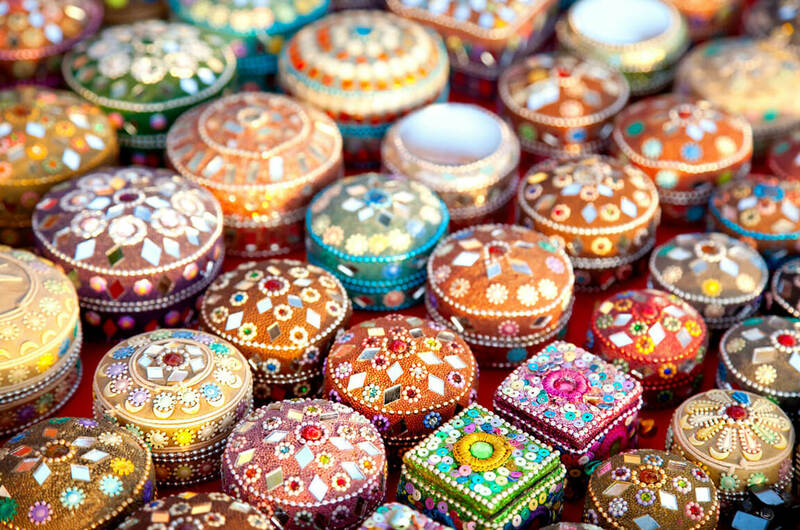 Kanha is one of the most popular parks in India, and in peak season it books up completely. Booking your safari, tour, and/or lodge visit about three months in advance, or more, is highly recommended. At 940 square kilometres in the core zone, and 1,009 square kilometres including the buffer zone, Kanha is the largest park in Central India. 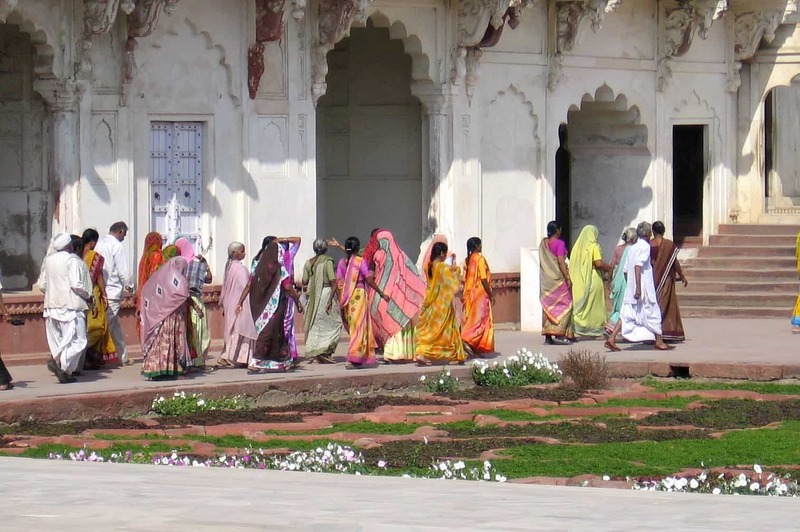 The park occupies a large forested area in the southern part of Madhya Pradesh, near Mandla. 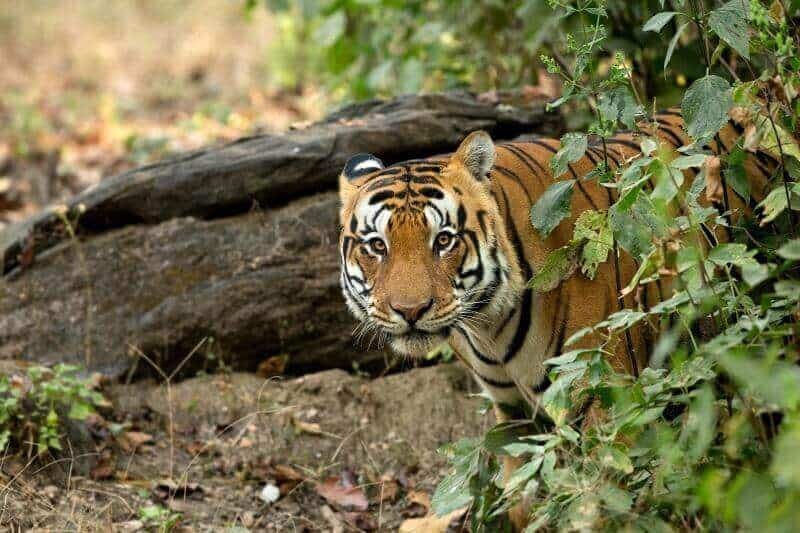 It is quite near the very centre of India, Nagpur, and within driving distance of three other major tiger reserves: Satpura, Pench, and Bandhavgarh. Many people do a one or two-week tour and visit several parks. There is no airport or train station nearby. You can fly into Jabalpur if you’re staying near Katia Gate (Kanha Earth Lodge, Kipling Camp); and Raipur if you’re staying near Mukki Gate (Singinawa, Bagh Villas). Then it’s a four- or five-hour car drive. The buses are slow and uncomfortable, and there’s no train (yet), so a pricey car drive / taxi is hard to avoid. If you book with one of the lodges that I’m reviewing here, they can help arrange your transportation, too, and book your jeep safaris. If you come on the Tiger Safari Tour with me, Pugdundee Safaris takes care of all your transportation and drives. 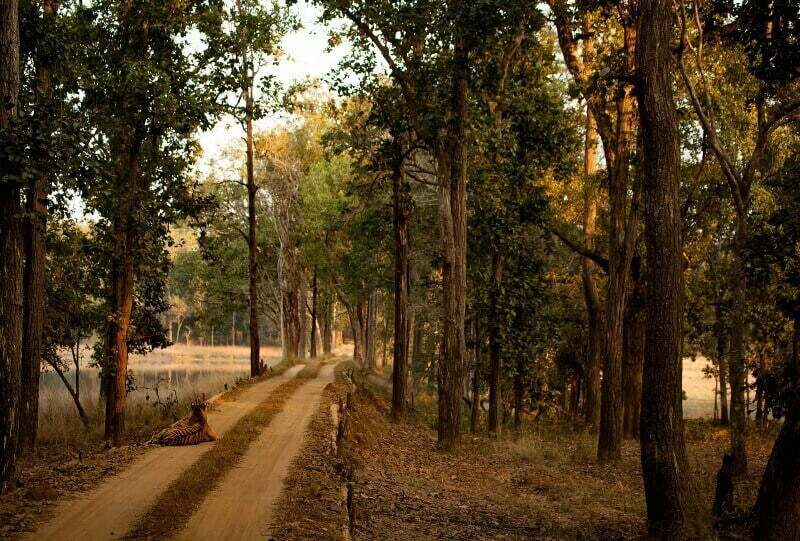 There are many reasons as to why Kanha is such a sensational park. One is that parts of this park have been a wildlife sanctuary since 1933. In 1955, about 300 square kilometres was declared a national park. And in 1973, 940 square kilometres became one of India’s original nine Project Tiger Reserves. Kanha is located in the Satpura range of the Maikal hills, in the central state of Madhya Pradesh. There are four main types of vegetation: moist deciduous forest, dry deciduous forest, valley meadow, and dadar meadow. Sal trees dominate the moist deciduous forest, giving Kanha its special character. Friends relaxing together in Kanha. Photo courtesy Harpreet Dhillon. 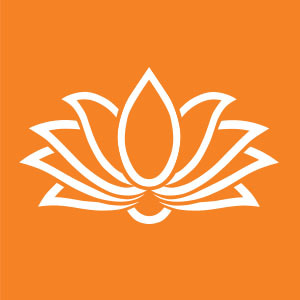 Not all of Kanha’s core zone are open to tourism. In fact, only a percentage is. There are two gates, Katia/Kisli and Mukki, and five zones: Katia, Kanha, Kisli, Mukki, and Serrai. 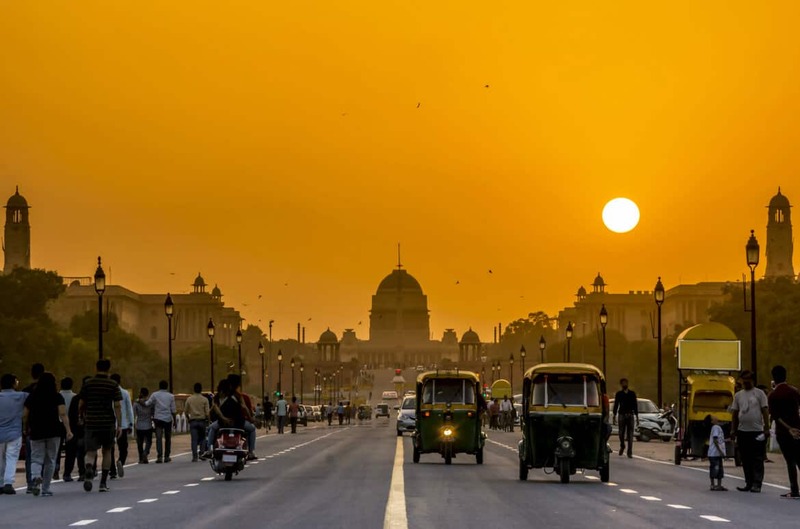 When you book a jeep safari, you will enter the park in a Maruti Gypsy (a jeep-like open vehicle) along with a driver (who may also be a naturalist) and a maximum of four other people. At the park gate, a government certified guide will join your vehicle, and tell you which zone you are assigned to. There are two wildlife safaris in Kanha National Park each day, morning and afternoon. The park is closed on Wednesday afternoon, which is market day in Katia. The morning drive starts about 6 am, and you can spend five hours in the park. You have to be out the gate by 11 a.m. The afternoon drive starts at 3 p.m. and lasts 3 hours. You have to be out the gate by 6 p.m. Please be mindful of the park rules, which are posted at the gate. They are meant to protect the animals and ask visitors to be mindful of noise, to not take anything from the park, etc. 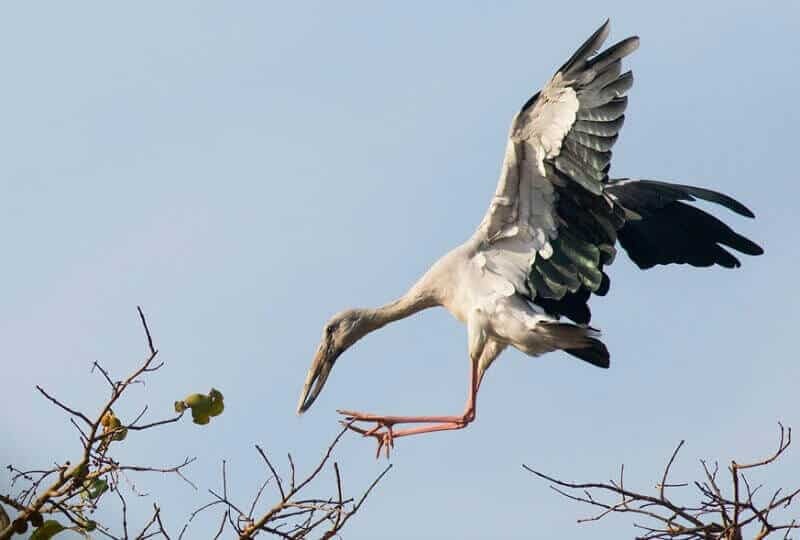 Kanha is a great park because of the profusion of birds and animals that thrive there. And of course the tigers. On Facebook, you can search for groups like Tigers of Kanha and Tigers of Central India, which are updated almost daily with tiger activity. On every drive to the park, you will never be disappointed – even if you don’t see a tiger. 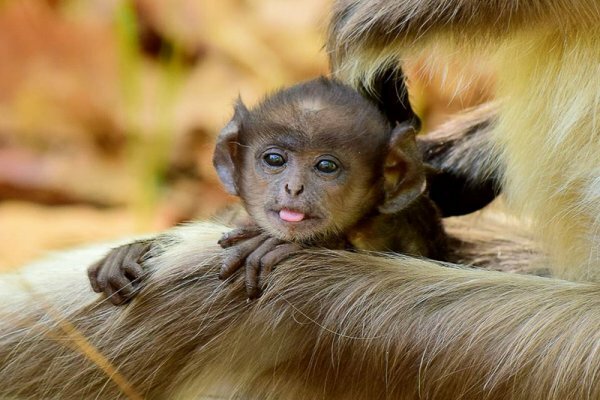 There are herds of spotted deer and Barasingha, troupes of langur monkeys, packs of wild dogs and golden jackals – 22 species of mammals in all. Plus, gaur, wild pigs, and jungle cats. 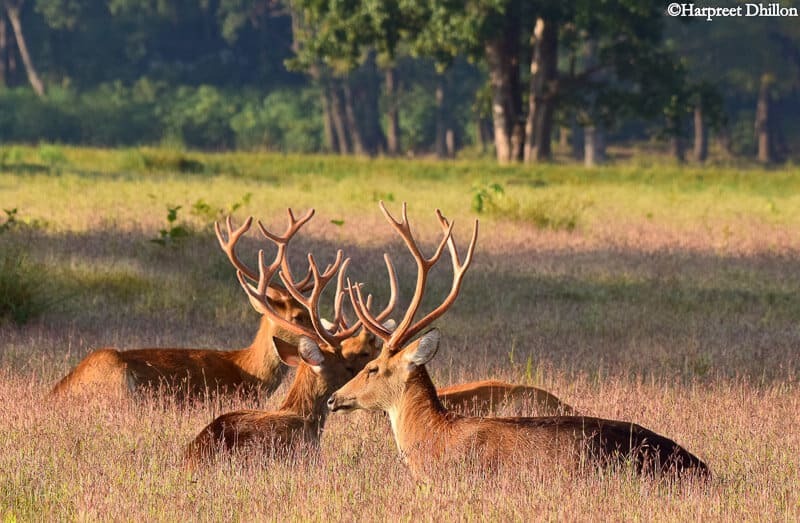 Kanha is the only place where you can see the magnificent Barasingha swamp deer in the wild: the park’s captive breeding program brought them back from the brink of extinction. Approximately 300 hundred bird species and 120 butterfly species. Birders especially love Kanha. But don’t be disappointed if you don’t see a tiger. Kanha is a beautiful park. The sal and bamboo forests are cool and dark. The meadows are sunny and replete with the tall grasses that many animals feed on. Flowering trees and shrubs burst into bloom at different times of the year. And the seasons bring changes, from the lushness of the monsoon to the dryness of late winter. You always stand a decent chance to see tigers in Kanha, but the best time is March to June, when it gets hot and the tigers (and other animals) are forced to the waterholes. From November to February, it can be very cool – even cold – in the park, especially for the morning drive. You will need to wear layers of clothing, and take it off as the day heats up. Light coloured, neutral clothing – in shades of white, beige, khaki, pale green – are the best, as they don’t distract the animals. A sun hat and bandana are always recommended. It can be very dusty, and you may want to cover your mouth and nose with the bandana. I also recommend taking a water bottle, tissue paper, and hand disinfectant. Toilet facilities are not always up to par, though they are better at Kanha than any other park I’ve seen. Lodges like Pugdundee, Singinawa and Bagh Villas supply breakfast, which you eat at a breakfast point in the park, so there is no need to bring your own food when you stay and book your safaris with these lodges. On cold mornings, they also provide you with blankets and even hot water bottles – it can be chilly in the morning from November to February, though very warm and pleasant in the afternoon. Kanha Earth Lodge is the premier lodge of Pugdundee Safaris. It’s architecturally stunning, constructed of natural materials like wood and stone, and blends beautifully into the environment. 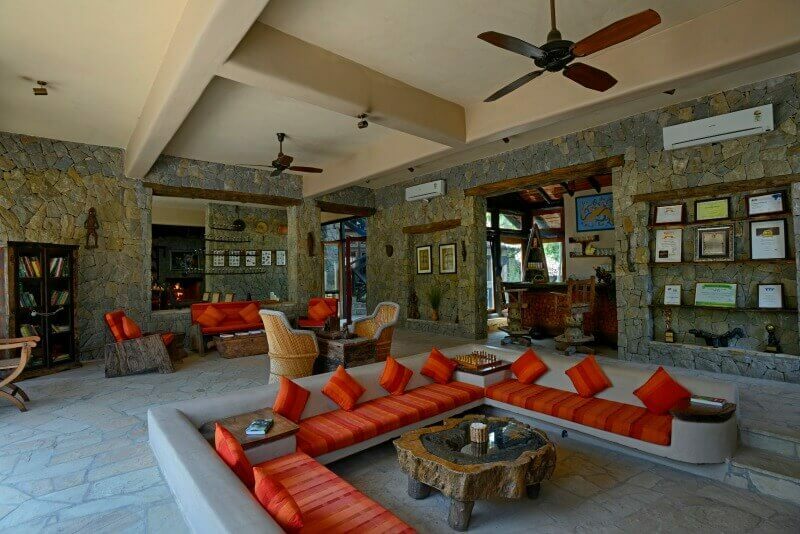 Accommodation is in 12 spacious villas, and the lodge also has a pool and several outdoor dining areas. Like all Pugdundee Safaris lodges, they treat guests to all kinds of special experiences and surprises such as field dinners, and outings to local villages and the sunset point. The lodge is located about a 30-minute drive from Katia Gate, far from the commercial activity the park attracts. Guests can walk with Pugdundee naturalists in the surrounding forest, which is alive with bird and animal life; or cycle to nearby villages. Kanha Earth Lodge has won many awards for sustainable and responsible practices, such as giving guests a reusable bottle and providing water refilling stations. There are so many great reasons to stay at a Pugdundee Safaris lodge, but number one is the naturalists. When you stay with Pugdundee, you are escorted into the park with one of their top-notch, outstanding and English-speaking naturalists. You can read much more about Pugdundee Safaris Lodges here: Home base for tiger safaris in India. 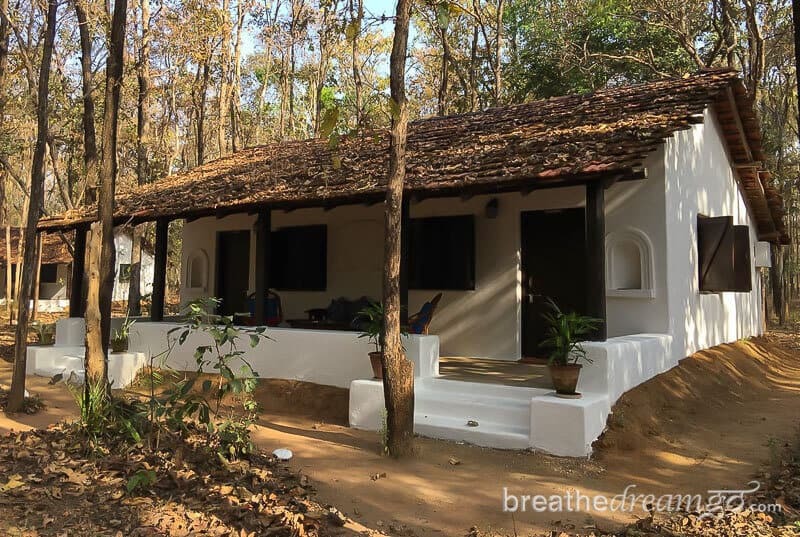 Kipling Camp was established in 1982, it was one of the first wildlife camps in India, and it’s also the closest lodge to Katia Gate. In fact, it’s so close, it’s in the buffer zone – and tigers and leopards are known to cross the property. The lodge has a relaxed, genteel atmosphere, which somehow seems to be in perfect harmony with the environment and the tiger safari culture. Not a surprise: it’s owned by well-known tiger conservationist Belinda Wright and her family, and it has retained the charm of a bygone era. This is the kind of place that makes people exclaim, “Don’t change a thing!” I concur. It’s perfect. Accommodation is in small bungalows, simple and comfortable. 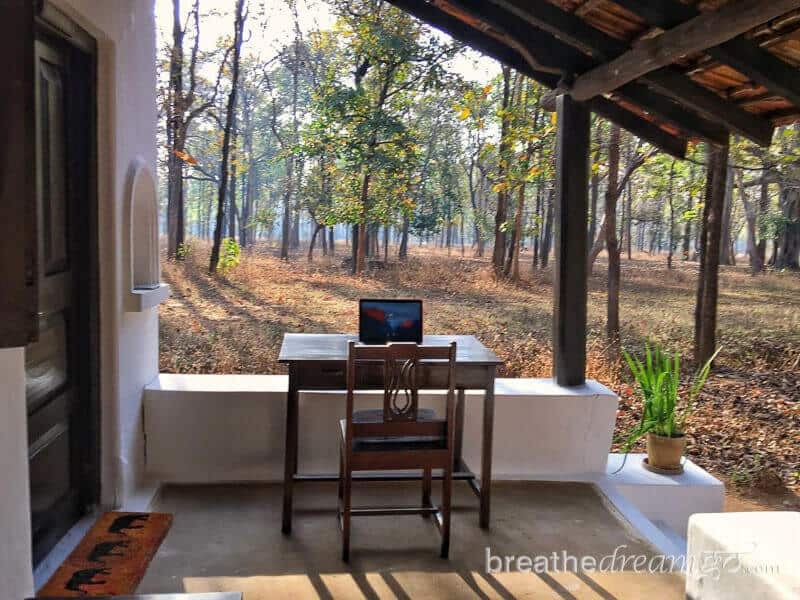 In mine, I found a perfect spot to situate my writing desk on the verandah, facing the sal forest and towards the park gate. Here, I could watch spotted deer nibbling at the grasses, and easily imagine a big cat walking the boundary … and in fact, sometimes they do. The open-air lodge building has a sitting room, a dining area, and a small library. The evenings when Ms. Wright is in residence can be very lively, with card games, and visitors who exchange tall tales of the forest that keep you on the edge of your seat. A very special feature of Kipling Camp is the presence of perhaps India’s most famous elephant, Tara. She is the star of a book by Mark Shand called Travels on my Elephant. Mark Shand gifted Tara to the Wright family in 1988, and she has lived at Kipling Camp ever since. The team at Kipling Camp are very protective of Tara, and dissuade any attempt to make her into a tourist attraction. 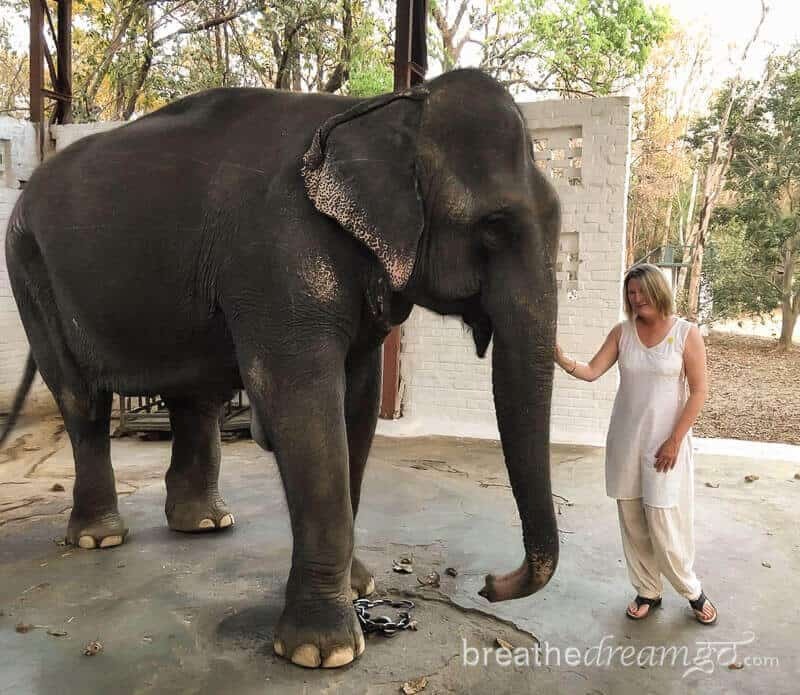 However, they do allow guests to walk to the river with her, and her mahout Luvkush, for a daily bath. And it is a very special experience indeed. There are three in-house naturalist at Kipling Camp. Naturalist Jeswin Kingsly has a B.Tech in marine engineering, trekking skills from NALS (where he was a trainer), and until recently he worked with WWF and was the Program Coordinator at Wildlife Wranglers in Coimbatore. Jeswin is a bird watcher of repute, a snake and animal rescuer and a wildlife photographer. He has worked on wild tigers and elephants and has a particular interest in butterflies. Naturalist Raghu Shukla was also born and brought up on the edge of Kanha, where he and his family still live. He has worked at Kipling for the past 12 years, as a Naturalist and the Assistant Manager. Raghu is a passionate conservationists who has taken thousands of visitors into Kanha National Park. Naturalist Rahim was born and brought up on the edge of Kanha National Park and he has worked at Kipling Camp for over 20 years. He is a passionate naturalist who knows Kanha and its surrounding area like the back of his hand. Rahim is considered to be the best bird guide in Kanha. In his spare time, he loves to plant and nurture trees. The staff at Kipling Camp were very helpful to me, and made sure I was able to get an add-on ticket and go into the park with some other guests. Rahim was my guide when I went into the park with Kipling Camp. I could sense that he had an intuitive understanding of the ecosystem, and it was fascinating to go on a drive with him. Singinawa Jungle Lodge is a very special place. The lodge is run with care and passion by owner Tulika Kedia and a very impressive team of professionals. From the managers through the house staff to the naturalists, they are an incredibly talented and dedicated bunch – including naturalist David Raju, co-author of the fantastic book Photographic Field Guide – Wildlife of Central India. While Singinawa has everything you would expect in a high-end safari lodge, it has much more as well. The main lodge building is sensational, with a grand staircase, tastefully decorated comfortable rooms, and lots of outdoor space to eat, have a drink or lounge after the day’s activities are done. The wood furniture, tribal art, and wildlife photos capture the spirit of a tiger safari in central India with perfection. The villas and bungalows are spaced throughout, with lots of privacy. They are spacious, also tastefully decorated, and with large, modern washrooms. The pool is gorgeous, and artfully set into the landscape, and I particularly loved the roofless change rooms. Singinawa is a large property at 110 acres, and shares the same habitat as Kanha’s core and buffer zones. The team takes great care to nurture and protect the property, on which birds and animals thrive. Elevated terraces and walking trails can provide great opportunities for bird and wildlife viewing. Just shortly before my visit, tigers were seen mating just outside the property fence, and more than 115 bird species have been recorded on the property. But Singinawa is much more than a luxury lodge. It is also a place dedicated to supporting the community, the environment, and the wildlife experience. 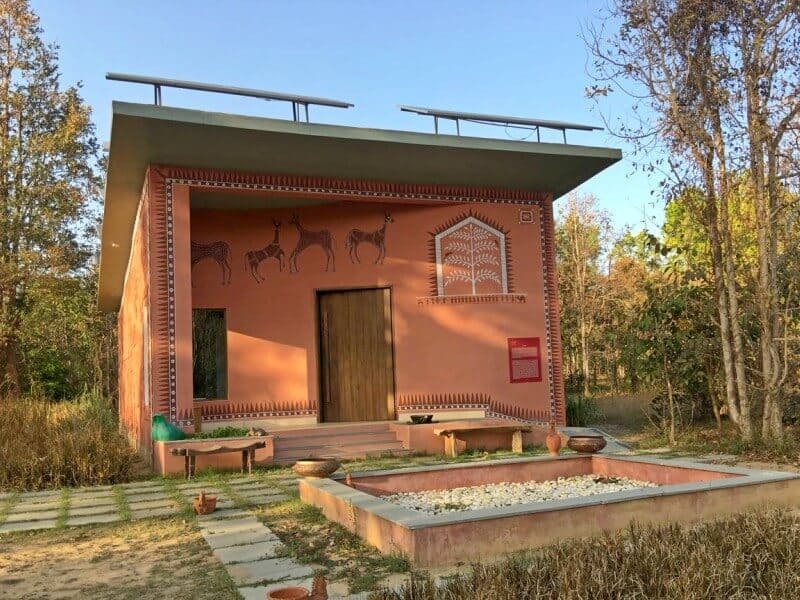 Tulika Kedia is not just passionate about wildlife, she is also a passionate supporter of indigenous art and she created the Kanha Museum of Life and Arts on the property. Here she displays pieces from her collection of art from the Baiga, Bhils, and Gond communities. 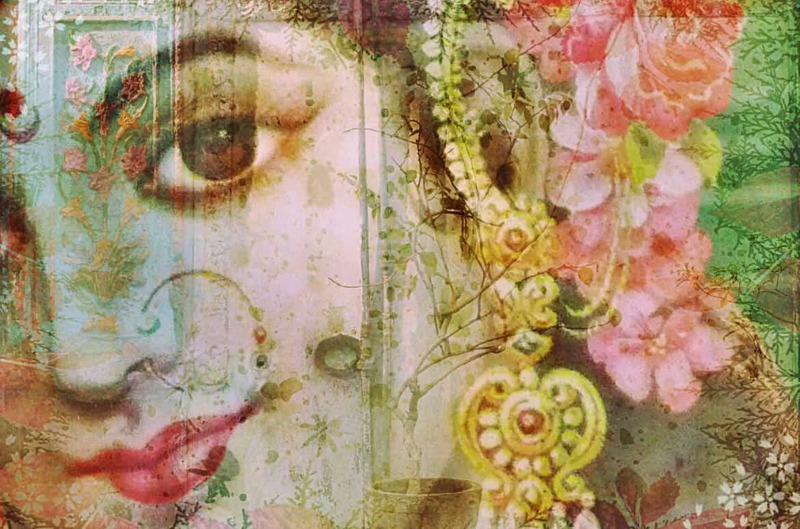 These artworks are extremely accomplished, but more, they tell a story of the earth and the sacred bond of connection between us. They dazzle us with colour, imagery and story, and also teach us to honour the earth, our mother. As conservation is a focus at Singinawa, I was asked to plant a tree before my departure. After several days of experiencing the forests and communities of Kanha through the Singinawa lens, I felt a deeper sense of connection and understanding. I did not simply stay at Singinawa, I experienced all the wisdom the people and place has to offer. 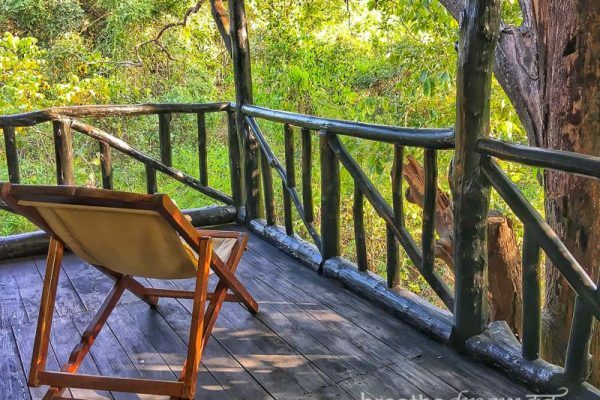 The newest addition to the luxury lodge category at Kanha hits the sweet spot in just about every way. Bagh Villas is a stunning property, lavished with loving care and attention by the owners Akhilesh and Lia. I will never forget walking through reception to see the lengthy infinity pool, with a backdrop of wetlands, lined on one side by gracious luxury tents in the traditional Shikar design. Wow is the only word to describe this place! Bagh Villas is run by a husband-and-wife team, Lia and Akhilesh, who contrast and complement each other, each bringing a different set of skills and expertise to the lodge, and that’s precisely what makes it so special. Akhilesh is a passionate and knowledgeable naturalist who loves travel, exploration, and the great outdoors. While Lia is a highly experienced spa director with a flair for international cooking and an eye for décor and detail. Together, they have created a place that is a genuine wildlife lodge with lots of extra special touches such as an international menu, chic décor, and a serene and beautiful spa. 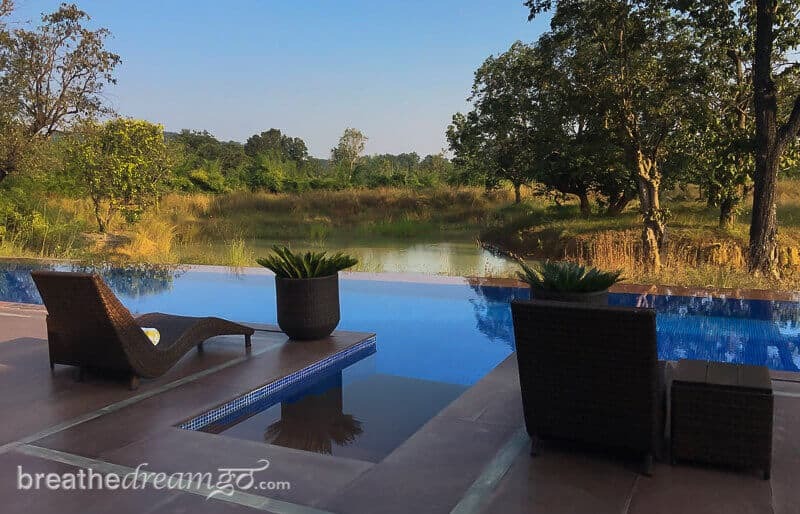 Sitting by the pool in the evening, watching the full moon rise over the forest and wetlands, and having a drink and snacks with Lia and Akhilesh is one of my favourite incredible India experiences. I also loved my luxury tent. Elevated on a wooden platform, it featured air conditioning and a verandah facing the lake – an ideal spot for relaxing and observing bird and animal life. A full-size bathroom and large, comfortable bed completed the picture, a perfect blend of outdoor living with comfort and convenience. Bagh Villas is both an immersion in luxury and a true wildlife lodge experience. 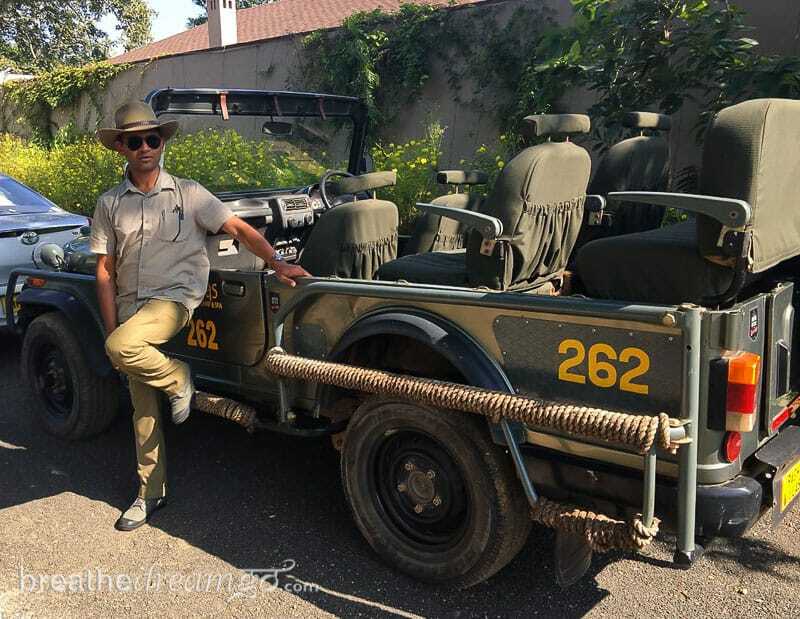 With Akhikesh at the head of team, an experienced naturalist will accompany you into the park in one of Bagh Villas’ jeeps – of which they seem to have many. They are very passionate about wildlife, birding, and conservation and are happy to introduce guests to the park as well as the surrounding communities. 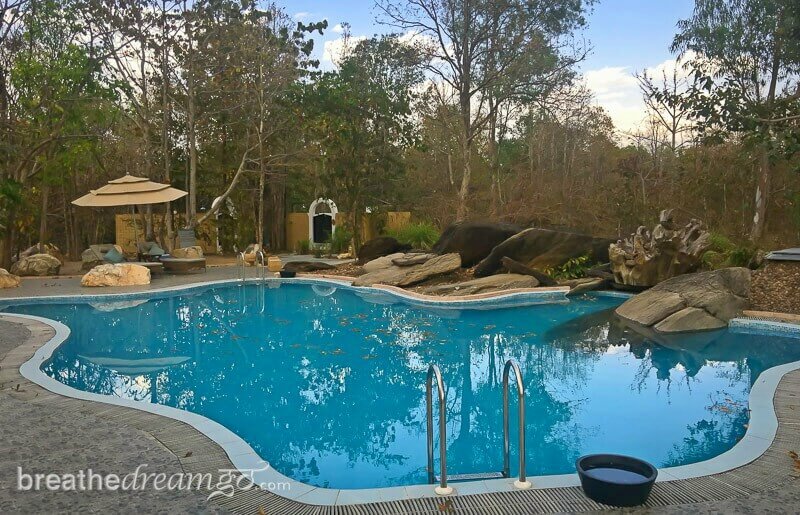 NOTE: I was hosted by Pugdundee Safaris, Kipling Camp, Singinawa Jungle Lodge, and Bagh Villas to experience the properties and game drives in Kanha National Park. My opinions and views are my own, and I write with the needs of my reader in mind.